0.1 What’s the system for? Ideology or Patients? What’s the system for? Ideology or Patients? Simpson’s main message is that improving Canadian healthcare rests on de-politicization, removing ideological models that cloud and obstruct meaningful progress. After all, patient outcomes are the priority. The reoccuring trap is to project onto the person speaking, judgements about their intensions. Focus rather on patient outcomes, says Simpson. Speaking Ill of Canadian Healthcare…is still sensitive: for decades, healthcare experts were talking about healthcare as part of a political dialogue. For example, Healthcare ministers were hesitant to tell the truth about how Canadian healthcare is performing in reality and with third party observers. The Canadian healthcare system is not ranked particularly well despite the spending in the top 5 in terms of universal models. Healthcare systems around the world were trying to compare countries in terms of performance. The OECD published healthcare statistics and comparisons. 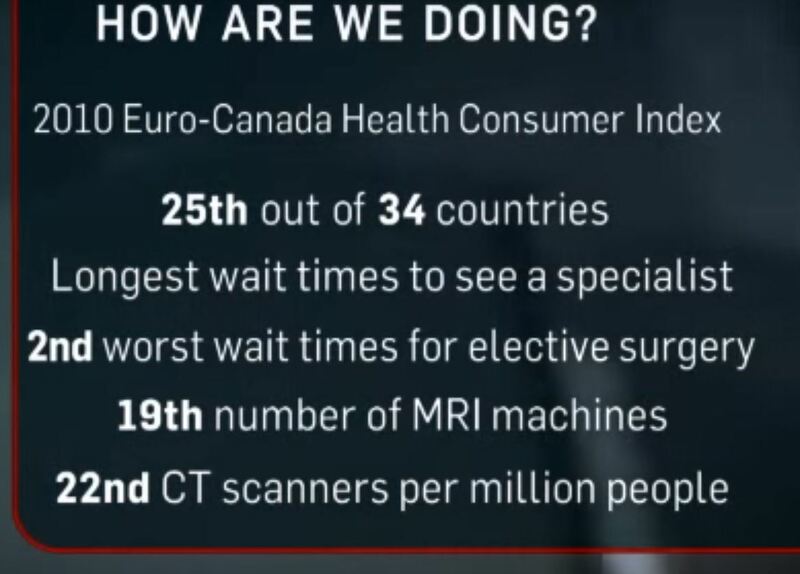 Canada spends the top 5 on health care and yet we were getting mediocre results. For the longest time, ministers couldn’t say that the Canadian healthcare system is not doing well in ANY respect. There are three reasons that any sweeping statement would be misconstrued. First, criticism was seen as the foot in the doorway for justifying an American style system. Secondly, attacking healthcare is like attacking Canadian identity since it is more valued than any other institution. Thirdly, criticisms by individuals means that person does not really share Canadian values. The Romanow 2002 Healthcare Proposal wanted to buy change in the system. Paul Martin and the premiers put together a spending strategy of 6% spending increase per year in order to improve Canadian healthcare. Unfortunately, Simpson says that spending more money into the system did not lead to the system getting materially better. Ontario increased the healthcare budget by 7% in the 2002 and then down to 2% by 2014. Alberta was at 9.5% in 2002 because there were high demands with new Canadians and migration to Calgary and Edmonton. Paul Martin believes that the Conservatives didn’t provide support on an annual basis with accountability amongst premiers but Simpson argues something else was at play…. Where did the funding go? In any public sector enterprise, the groups that are the most mobilized will take a disproportionate about of the funds in order to justify reallocation of resources for themselves. And they will do so by providing data from other jurisdictions like Germany etc. Scandinavian doctors get paid half what Canadian doctors get paid on average so that’s not helpful to the cause. As a result of careful selection bias by advocated, the increased funding went to the most expensive parts of the system; the employees themselves. The funds did not go to better patient care per say. The system became less productive in fact because doctor and nurses were getting paid more. Canadian Institute of Health Information shows that physician spending compensation is growing fast. Physician income was going up incrementally year on year during this time frame. From 13 to 14.5% increases. Doctors fees and compensation went up 3x, Nurses were paid 2x. A counter-argument might be that doctors in other jurisdictions were also getting pay raises therefore there was the risk of losing talent in Canada…. Governments frequently like to have peace by paying doctors and nurses more. Strike actions are very unpopular and can unseat politicians if timed correctly. Simpsons says, we need to make changes but need to think about changing the system. The community care budget is going up by 4% for example. We want to take the power our of the hospitals according to Simpson. It takes time to get the governance structure changed but hospitals have a disproportionate power in Ontario. Saskatchewan has health regions, it means there is better integration between the hospitals, in community and other levels of the healthcare system. Diffusing power across organizations means a web of care for patients rather than a hierarchical doctor led model. Reduction in the Transfers from the Federal Government to Provinces: You want a vertical integration within the system at the provincial level. However Ottawa is going to be spending less on healthcare. Ontario with the LHIN (Local health Integrative Network) has competing political centres of authority. Have we settled where our healthcare spending is going to go i.e. around 2% but will there be pent up demand from doctors and nurses? At the Federal level of spending, there is expected to be stability. There is a political decision around reducing the 6% transfer to the provinces. The Federal government will always play off the provinces and vice versa. There is a fiscal sustainability at the Federal level but anticipated unsustainable spending situation at the Provincial level. Aging of the Population: The cost of healthcare is being shifted to younger generations as the babyboomers retire and leave the productive work force; leading to potential gaps in productivity. This will not be Tsunami of growth in healthcare spending, it will increase 1% or 2% in healthcare. In the 1960s, the average Canadian was 27 years old and now 2016, the average Canadian was 47 years old. We spend $210 billion on healthcare; 70% of which is public and 30% of which is private. $150 billion is public with a 1% increase, it’s not great tsunami. So if we can deal with community care, we have fighting chance of controlling costs. 14% is over 65 and they take 45% of healthcare spending. But by 2030, 26% of the population is going to be 65 years old. The actuaries are revising the tables because more people are living past 85 years old. If you have fewer people earning money in the +65 year old age range, we have a GDP drop according to Simpson. So the challenge is that the pool of taxable productive Canadians is going to shrink in the coming years. While is seem logical that the revenue pool will shrink as the productive population ages, it is also the case that we have increased immigration of 1% up to 3% (and have that immigration distributed across Canada rather then centralized in urban centres of the M.T.V. Montreal, Toronto, Vancouver). Technology in Healthcare: technology can cost you money. A new cancer pharmaceutical drug comes on the market that only extends life by a few more weeks and is not a cost-effective addition. BUT you still have the opposition parties attacking the minister for being cruel and then the minister reliably caves to the pressure. Acute Care in the Hospitals: citizens go to hospital for cuts and bruises rather than to their local clinic because the hospital is “free”. There is strong evidence to show that patients are abusing the system as a free take-it-or-leave-it system. Hospitals are rewarded for the number of people going in. The hospitals are the centre of the system: it’s hard to close a hospital; so efforts should be made to get tougher on hospital spending. Doctors Costs: the costs for medical personnel is in the top three countries in OECD. We have fewer physicians per capita; we are way above average cost. The reason being that physicians are given a premium to relocate to rural areas in Canada; and health authorities have to compete for competent clinicians. A family physicians costs $250K per year for example in Ontario. They are civil servants but act like bankers according to Simpson. Pharmaceuticals Costs | Ego in the System: the costs are high. Canadians are big drug users. We use drugs a lot. Drugs can save money by preventing costs at the hospital. The provinces are in charge of drugs and they have a formulary to the pharmaceuticals. We have ten negotiating parties with the pharmaceuticals. one per province. Provinces should be allocating a negotiator. However, the fragmentation is indicative of the power structures embedded in the system. We need bulk buying according to Simpson. Of course, each province has different needs demographically speaking and coordinating might be a challenge but it’s worth considering a joint effort. Core problem is “where is the stick: what happens if the system under performs?” So what if Canada spends more and gets less than Germany etc? What is any individual going to do about that? That seems to be the challenge.